Some 200 people held a demonstration in central Bat Yam Monday evening against relationships between local Jewish women and Arab men. One of the protestors called out, "Any Jewish woman who goes with an Arab should be killed; any Jew who sells his home to an Arab should be killed." 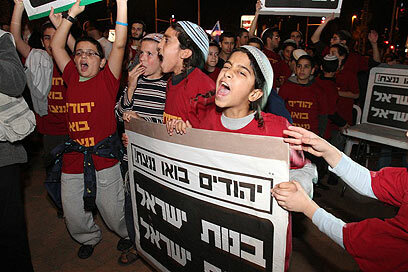 During the rally, held under the banner, "We Want a Jewish Bat-Yam", demonstrators also insulted the prophet Muhammad and made racist remarks against Arabs and their saints. Police forces maintained order, but did not act when the demonstrators made racist remarks. "We are not racist, we are just Jews. The Arabs are coming and taking our daughters. We will not allow it," one of the speakers said. Moshe Ben-Zikri of Eilat said the "struggle" began three years ago in Givat Ze'ev. "There were 330 Arab families there, and the Jewish women would walk around with them freely. We vowed this would not happen again. "Just like we triumphed there, we will triumph in Bat Yam as well. We are not afraid of the police, the media or the Arabs – we only fear God," he said. Bat Yam Mayor Shlomo Lahyani strongly condemned the event and those who took part in it. "The city of Bat Yam denounces any racist phenomenon. This is a democratic country with laws," Lahyani told Ynet angrily. He denied claims made by extreme right-wing activists Itamar Ben-Gvir and Baruch Marzel that this was a local initiative. "I would like these honorable gentlemen to find a different tree to climb on, far from Bat Yam. I am certain and I know that most of the protestors are not Bat Yam residents. This is a foolish attempt to create a provocation, which has failed." Ben-Gvir and Marzel responded to the mayor's accusations, saying that "Mr. Lahyani has failed in his attempt to ignore the harsh reality in Bat Yam, which has been taken over by hostile elements and is suffering from assimilation. The crowd which took part in the protest was furious at the failure to deal with this phenomenon. We suggest that Lahyani stop ignoring the danger." One of the event's organizers, Bentzi Gupstein told Ynet Sunday night, "So many Arabs are dating Jewish women, and the public is fed up with it. 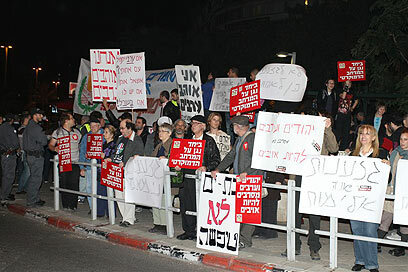 A short distance away, about 200 leftists and Arab residents of Bat Yam held a counter protest. They waved signs reading, "We're fed up with racists" and "Jews and Arabs refuse to be enemies". See all talkbacks "Bat Yam rally: Death to Jewish women who date Arabs"